A StaticStructuralResults object contains the displacement, stress, strain, and von Mises stress in a form convenient for plotting and postprocessing. Displacements, stresses, and strains are reported for the nodes of the triangular or tetrahedral mesh generated by generateMesh. Displacement values at the nodes appear as a structure array in the Displacement property. The fields of the structure array contain components of displacement at nodal locations. Stress and strain values at the nodes appear as structure arrays in the Stress and Strain properties, respectively. von Mises stress at the nodes appears as a vector in the VonMisesStress property. To interpolate the displacement, stress, strain, and von Mises stress to a custom grid, such as the one specified by meshgrid, use interpolateDisplacement, interpolateStress, interpolateStrain, and interpolateVonMisesStress, respectively. To evaluate reaction forces on a specified boundary, use evaluateReaction. 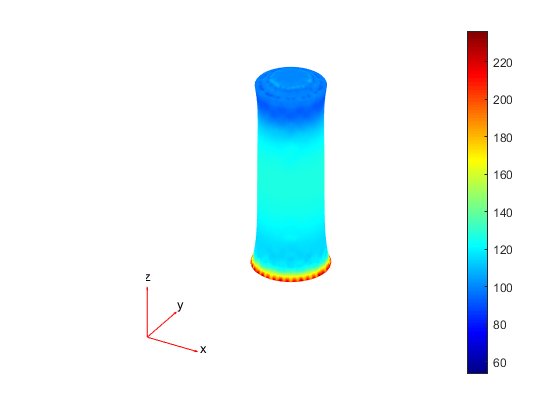 To evaluate principal stress and principal strain at nodal locations, use evaluatePrincipalStress and evaluatePrincipalStrain, respectively. 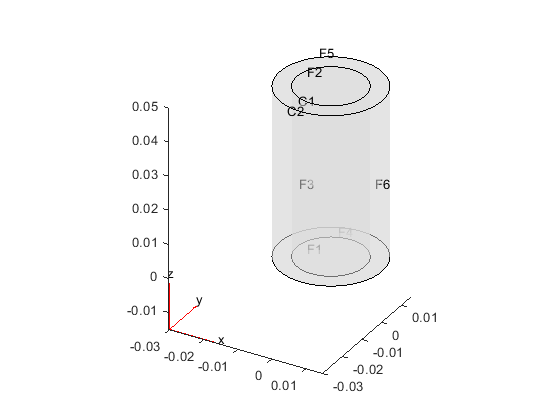 Solve a static linear elasticity problem by using the solve function. This function returns a static structural solution as a StaticStructuralResults object. Displacement values at the nodes, returned as a structure array. The fields of the structure array contain components of displacement at nodal locations. Stress values at the nodes, returned as a structure array. The fields of the structure array contain components of stress at nodal locations. Strain values at the nodes, returned as a structure array. The fields of the structure array contain components of strain at nodal locations. Von Mises stress values at the nodes, returned as a vector.